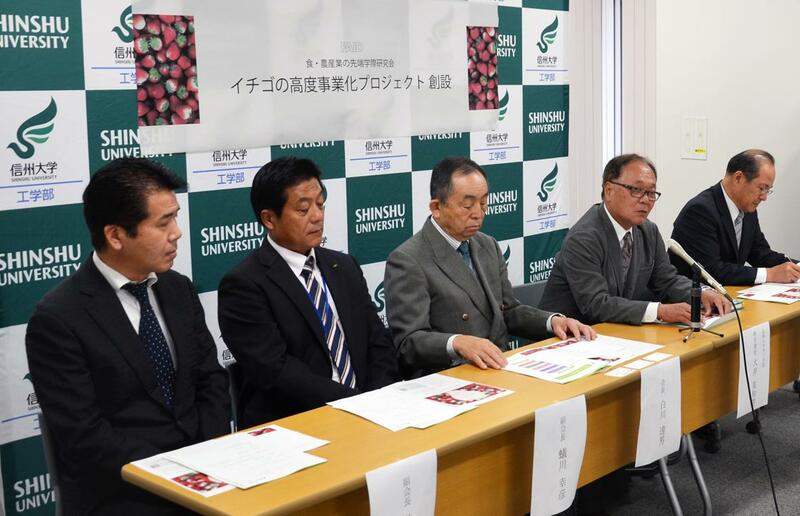 Food and Agriculture Industrial Development (FAID) interdisciplinary research group through industry-academia-government-financial collaboration with Shinshu University launched "Research Project on Advancement and Commercialization of Summer Strawberry" and held a press conference on October 16, 2017. FAID has been continuing activities to disseminate summer-to-autumn harvest strawberry (Shinshu Univ. BS 8-9) which is developed by Professor Michio Ohi. In this project, we aim to further spread and develop everbearing strawberry through industry-academia-government-financial collaboration for the purpose of establishing a method of strawberry cultivation all year round, sophistication of proper cultivation, and project for high value added products.